The Relentless Builder: How Old is Too Old to Sit on Santa's Laps? 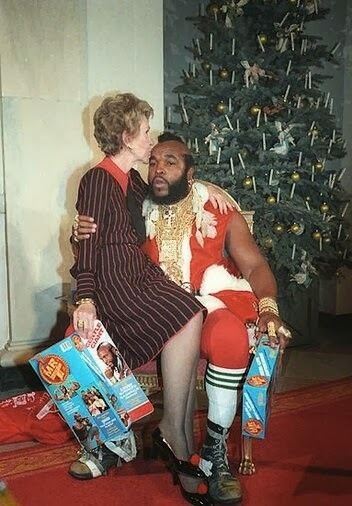 Nancy Reagan sitting on Mr. T's (Santa Claus) laps. Where's his cap? To be clear, the picture above did not inspire this post, but I think it suits the topic: how old is too old to sit on Santa's laps. Now, for the sake of clarity, I need to state that the real reason for Christmas is Jesus. We celebrate the birth of Jesus at Christmas. However, unless you've been living under a rock, there is an entire Christmas culture built around the non-existent Santa Claus. So, in today's world, Christmas also evokes images of the big bellied old man wearing red and white. Don't even ask me why I am posting a Santa Claus-themed post in January. Close to Christmas time, and most especially, around Christmas time, we see a lot of Santas sitting beside large Christmas trees waiting for people to sit on their laps and make wishes. I use the term "people" very loosely here because pets sometimes make it onto Santa's laps too. What a dog would be wishing for at Christmas beats me. But hey, it happens. Ordinarily, one would expect that sitting on Santa's laps would be reserved for the youngest members of the family, usually toddlers, younger children or the occasional pre-pubescent children who still believe in the existence of Santa Claus. But interestingly, children (and pets) are not the only ones who take turns sitting on Santa's laps and barking making requests. Adults do too. And by adults, I mean anyone who knows where babies come from, and all the people from ages 18 - 120. So, the lingering question remains: how old is too old to sit on Santa's laps? Please enlighten me. I say no to AGE LIMITS! As long as you can balance on the LAP, feel free! After ten years old please, even my cousin didnt sit on Santa's lap after 8, he said he was a litle to old for that. 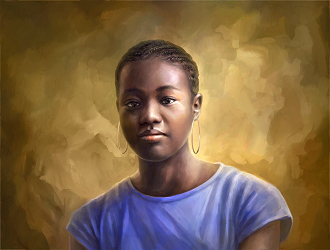 Sisi Blu: Lol! If Santa doesn't protest, nothing else matters, ba?